A metastable SiOx phase naturally decays upon thermal activation to Si and SiO2. Adopting suitable geometrical constrains at mesoscopic scale, it is possible not only to exploit such a Self Assembly process to obtain a quantum dot silicon system embedded in a SiO2 matrix, but also to create it in a suitable configuration for efficient room temperature device operation, i.e. with a sub-5 nm quantum dot size, and sufficiently close to contact leads for a high level of control on the system. 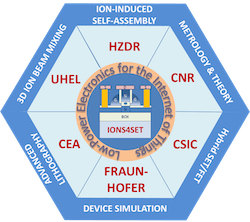 IONS4SET will take advantage of process simulations to unravel the effect of the several experimental parameters and their interplay. Moreover, such a core activity of the project stands on the solid basis given by the FP6 project NEON, in which some of IONS4SET partners were involved and which already investigated the principle of operation for the exploitation in non-volatile memory devices based on Si nanoclusters (European patent EP 1 070 768 B1, applied in 2000 and granted in 2005 to HZDR partner). But that's not enough for us. 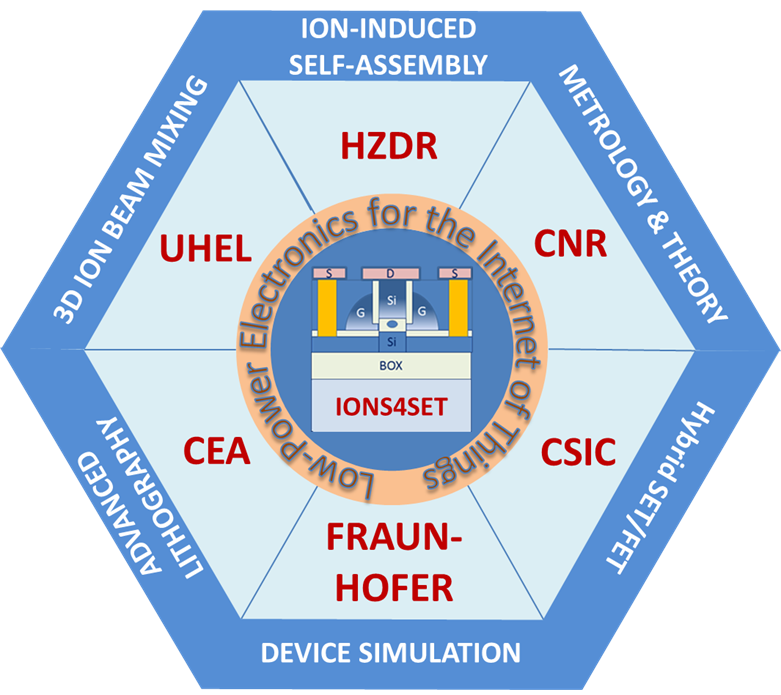 IONS4SET consortium not only aims at the production of an effective room temperature demonstrator device. 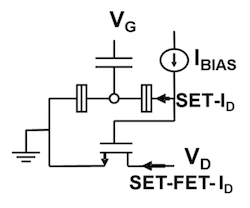 The technology is to be developed in fully compatible CMOS technology for a ready and direct transfer to current industrial processes and standards. This fact will grant a high and rapid impact on society, a perspective which has gathered the attention of the key industrial companies GlobalFoundries, STMicroelectronics and X-FAB since the very start of the project. - University of Helsinki will develop a 3D simulator for ion irradiation processes on nanostructures. For the description of project organization into workpackages, click here.